Use a good recipe: Start with a recipe from a source you trust. Use the pan size called for in the recipe and either line it well or grease and flour it. Preheat the oven: If you put a cake into an oven that’s not hot enough, it will affect the way it rises. Be accurate with measurements and ingredients: Make sure you use the exact measurements and ingredients as stated in the recipe. And use proper measuring spoons. Get as much air into the cake as you can: Cream the butter & sugar until the mixture lightens in texture and colour. This increases the air and volume of the cake, giving you a lighter result. Once the cake is mixed put it straight into the oven: The raising agent will start working as soon as it comes into contact with any of the ‘wet’ ingredients so to ensure a good rise your cake mixture should go into the oven straightaway. Put the cake on the middle rack and keep the oven door closed: Cakes are generally best placed on the middle shelf to ensure even cooking. Once the cake is in, avoid opening the door until it’s almost cooked. Stick to cooking times: If you’ve used the right pan, the timings stated in the recipe should be accurate. A skewer inserted in the centre should come out clean or with just a few moist crumbs attached. If your cake is not properly cooked but looking too dark, you can cover it with a bit of parchment paper for the final minutes of baking. Cooling cakes: As a general rule, most sponge cakes are best left in the pan for a few minutes and then turned onto a cooling rack to avoid soggy edges. Take care not to overmix your batter. Stir wet and dry ingredients together just until combined. A few lumps are okay. First cook a mini pancake to test if your pan is the right temperature. Wait until most of the bubbles on the top have burst before flipping your pancake. And only flip your pancakes once. Don’t “pat” your pancakes with the spatula. That will flatten the fluffiness. Mix the batter gently and always by hand, using a rubber spatula or wooden spoon to fold the wet ingredients into the dry ingredients. When you add the wet ingredients to dry, mix just until barely combined. A few streaks of flour or some lumps in the batter are fine. Bake your muffins as soon as the batter is combined so the leavening agent can do its work in the oven. Chocolate is naturally acidic. In Dutch-processed cocoa, the acid has been neutralized, making the powder darker and milder in flavour. Natural cocoa powder still contains cocoa’s natural acids. It’s lighter in colour and more intense. When it comes to baking there are a couple of things to remember. Baking soda in a recipe needs an acidic ingredient in order to make baking rise. If your recipe calls for baking soda and you’re using Dutch-process cocoa, make sure there’s an acidic ingredient in your recipe to help activate the baking soda (like molasses). According to Fine Cooking magazine, you can substitute natural cocoa powder for Dutch-process in most recipes (though not vice versa). Bring a pot of water to the boil. Slice a small “X” in the bottom of each peach and drop into the boiling water for 30 seconds. Remove from the water with a slotted spoon and when cool enough to handle slide off the skins. Slice into quarters and pry each quarter off the pit. From there you’re all set to slice the peaches. Choose light coloured pans for baking. Breads, cakes, muffins & cookies baked in or on dark coloured pans will brown (and may be burn) more quickly than those baked in light coloured pans. If you’re baking in dark coloured pans or glass baking dishes reduce the oven temperature by 25 degrees and check for doneness a little earlier than called for in the recipe.  Wait for the final few minutes of grilling before you baste your burger (or other grill-able) with barbecue sauce. The sugar in barbecue sauce can burn easily and scorch your supper. Split them down the middle into three sections. The key to flaky flavourful pastry is to use ice cold butter (or shortening) and to work the dough as little as possible. You can freeze your butter and then grate it into the flour mixture or cut it into cubes and pulse it in the food processor along with the flour, stopping once the butter is pea-sized. Be sure to use ice cold water to bind it all together. Finally, mix the dough just until it comes together. Chill for an hour before rolling out. Desserts with red are Valentine‘s Day classics but the safety of red food colouring is questionable. Add colour, minus the chemicals, using natural fruit & vegetable pigment. Raspberries: For a pretty pink blush use the juice from raspberries to tint your frosting. You’ll get lovely raspberry flavour too. Beets: Adding fresh beet juice to frosting intensifying the colour without adding flavour. Simply grate a fresh beet and squeeze the juice into your frosting. Here are more tips for colouring your confections naturally. If you’re baking gluten-free quick breads (muffins, biscuits & tea breads) add ½ tsp. 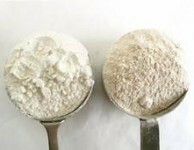 of xanthan gum or guar gum for each cup of GF flour used. 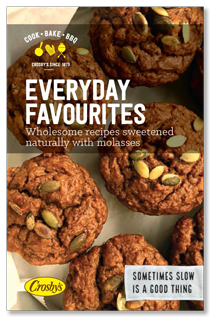 If you’re adapting recipes that call for all-purpose flour, recipes containing fruit or vegetable purees (ex. apple sauce or canned pumpkin) adapt well to gluten-free flour since the added moisture from the puree helps with the texture of the finished baked goods. 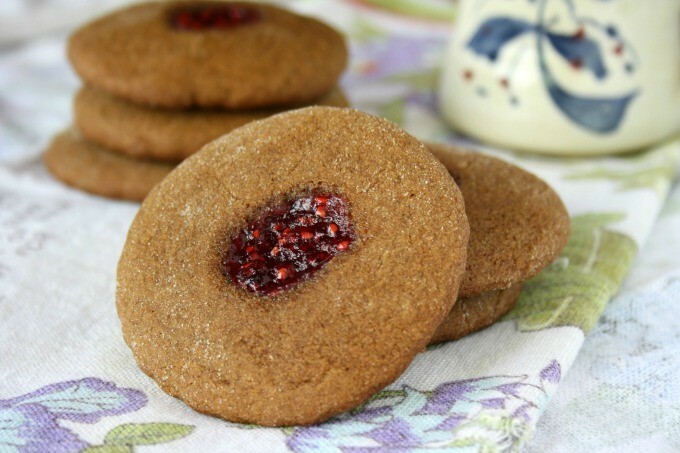 Molasses helps to keep GF baked goods moist too. Baking Tip: Refrigerating cookie dough makes your cookies taste better. Refrigerating your cookie dough actually improves the texture and flavour of the finished cookie. Chilled cookies will taste a little sweeter and the sugars will caramelize more quickly when baked. Chilling dough also helps with the texture of your finished cookies since it allows the gluten in the flour to relax. Flavours, like spices, have more time to develop when the dough is chilled. If you have time, chilling your dough overnight, and up to 36 hours, can make a tasty difference. The uses of parchment paper go way beyond lining cookie sheets. I stuff it into bread pans, square and rectangular cake pans and baking dishes. You’ll find that with parchment paper everything browns perfectly and clean-up is a cinch. Remove leftover puree from the can into a non-metal food storage container and refrigerate up to a week. You can also freeze leftover pumpkin puree in handy half cup portions. Blend spices and store in an airtight container. 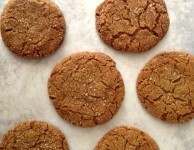 If you find yourself mid-baking and low on brown sugar, don’t fret – it’s easy to make your own. 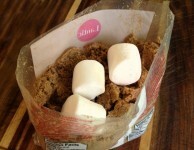 Brown sugar is simply white sugar with molasses added for flavour and moisture. To make light brown sugar whir 1 cup white sugar in a food processor with 1 Tbsp. of molasses. For dark brown sugar whir 2-3 Tbsp. of molasses with one cup of white sugar. Start with cold butter. Measure your butter right out of the fridge when it’s good and cold, cut it into chunks and work it into the flour mixture with a pastry blender or two knives. Leaving pea-sized chunks is a good thing. When you add the liquid to the flour-butter mixture, mix gently until almost incorporated. Taking care not to over-mix the dough will help to keep the dough light. After you scrape the shaggy dough and bit of unincorporated flour out of the bowl and onto the counter, work the dough together with a light hand. I try to knead it no more than 10-12 times. Press lightly when you pat out or roll out the dough. When you’re cutting the dough, push the biscuit cutter straight through, taking care not to twist it. Put your pan of unbaked biscuits in the fridge for an hour if you have time, then put them directly in the preheated oven. Whisk 1 Tbsp. ground flax with 3 Tbsp. of water. ¼ cup unsweetened applesauce mixed with ½ tsp. baking powder. The baking time for a cake is important but don’t let it be your only guide. There are a couple of other guides to help you decide if the cake is ready to remove from the oven. Touch the top: The middle of the cake should feel slightly springy when you press on it lightly. Use a cake tester: If a cake tester (spaghetti, tooth pick) comes out clean or with just a couple of crumbs attached then your cake is ready. If your recipe calls for buttermilk and you have none on hand no need to run to the store. Make your own by substituting plain yogurt, a 50/50 mixture of milk and yogurt, or sour the milk with lemon juice or vinegar. To sour the milk add 1 Tbsp. of vinegar or lemon juice to a cup of milk and let it sit for a few minutes to curdle. If your recipe calls for softened butter and your butter is either frozen or fridge-cold, there are several of simple ways to soften it in a hurry. Measure your butter and then grate it using the large-hole side of a box grater. This works especially well if your butter is frozen. Measure your butter and then cut it into little chunks and spread out on a plate to warm. Measure your butter, place it between two sheets of parchment paper and pound and roll it with a rolling pin. Measure your butter and massage it with your hands. This is messy, but it works. For each square of chocolate called for in a recipe substitute 3 Tbsp. of unsweetened cocoa powder mixed with 1 Tbsp. of melted butter. Whisk until smooth. How to make great pastry for the perfect pumpkin pie. The key to flakey flavourful pastry is to use ice cold butter (or shortening) and to work the dough as little as possible. You can freeze your butter and then grate it into the flour mixture or cut it into cubes and pulse it in the food processor along with the flour, stopping once the butter is pea-sized. Be sure to use ice cold water to bind it all together. Finally, mix the dough just until it comes together. Chill for an hour before rolling out. When cooking with apples, mix and match varieties to get the best combination of flavors and textures. Some apples break down more easily when they cook, like McIntosh, and others hold their structure better (think Cortlands). By combining different varieties in a pie you’ll be able to combine flavours and textures. To keep your bottom crust from getting soggy during baking place your pie plate directly on a baking sheet that has been placed in a 400 F oven for 15 minutes. This allows the crust to start baking more quickly, sealing out the filling juices. The baking sheet does double duty by catching any juices if the pie bubbles over. Most cookies are done when their edges are golden brown. But dark-coloured cookies, like molasses and chocolate, can’t be so easily judged. Instead, test these cookies for doneness by nudging the edge gently with a utensil. There should be very little give around the sides. If you’re adding fruit to cakes and tea breads, toss it with a tablespoon or two of flour before adding to the batter to keep it from sinking to the bottom. When baking with eggs make sure they’re at room temperature. If eggs are cold they won’t give as much lift to your recipe and depending on what you’re baking, this might have a big impact on your end results. 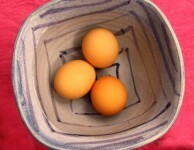 To warm eggs that have just come out of the fridge place them in a bowl of warm water for 10 minutes or so. Add a few drops of vinegar or lemon juice to a small amount of baking soda. If it bubbles up it’s still good. For the final rising in yeast bread recipes, let dough rise until it has almost doubled in size and a finger gently pressed against the side creates an impression that slowly fills in. Once in the oven the dough will continue to rise to create a nicely shaped and well textured loaf. Letting the dough rise too much before baking could result in a crumbly loaf. To make muffins and quick breads with a light texture be sure to work the batter as little as possible. Mix with a light hand and just until the dry ingredients are incorporated into the wet. Over mixing will make your breads and muffins tough. When baking, be sure to pre-heat your oven. The oven needs to be at the temperature specified before you put your baking in. This allows the items to rise properly and bake evenly. Looking to incorporate more whole grains into your diet? Try baking with whole wheat or spelt flour. You can safely substitute up to half of the flour called for in a recipe with a whole grain variety. Measure flour carefully by spooning it into the measuring cup. 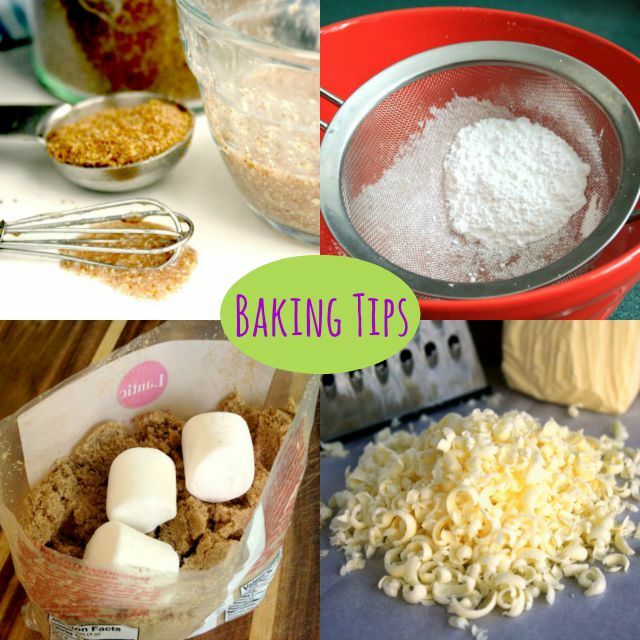 If you scoop the flour into the cup, or shake the measuring cup to level it off, you’ll end up with too much flour and that could make your baked goods tough and dry. Also, when you add the flour (and other dry ingredients) to the recipe, mix just until the flour is incorporated. When a recipe asks you to cream butter and sugar, cream the butter first then slowly add the sugar. It’s a science thing…the butter molecules can better incorporate the sugar when it’s added gradually. Brush the measuring cup with a little oil before you pour the molasses in and you’ll see how easily the molasses slips out. Great to have the tips all in one place, almost like a baking lesson. Hi Bridget,Thanks for these baking tips and new baking with apple recipe. Thanks for the tips, we can always learn something new. 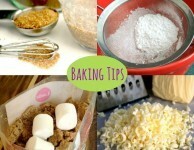 Hi Bridget: Just like to say you are never too old to learn new “tips” in baking. …………… Thanks so much for your informative & interesting recipes………..
Hi Gloria, I agree, you’re never too old to learn…Plus it’s fun. great tlipe …some I remembered but others were new…can’t wait to make my next apple pie.!!!!!! If you’re doing a lot of baking you can re-use the parchment paper numerous times… And when I’m done with it, I put it in the compost! When I make pie that needs an already baked crust, it always shrinks. Can this be fixed? Hi Maryanne, I always chill my crust before I pop it in the oven. And I use pie beans. It still shrinks but not too much. Hi Briget hope you are enjoying our warmer weather . Just love all your tips and recipes . Have tried all the recipes in the Cook Book you sent me ,impressed friends and family always requesting your recipes . You really did get me back into my cooking and baking after fighting Cancer . I thank you so much and appreciate all your posts . Thanks Lila, I’m so happy that baking and cooking has been part of your journey back to health. There’s nothing like sharing food with family and friends to make you feel whole again. Well I like to cook and with these great tips I’m on my way to try baking. What my family and friends love is Lemon Meringue Pie and I would like to try making, but how to make the meringue stay up. That is the million dollar question. Hi Thomas! A couple tips for the meringue would be using room temp eggs and adding a pinch of cream of tartar or lemon juice to add volume to the egg whites. Hope this helps! Thank you so much for the hints and yet another great cookbook. I have been printing out a few for my friends and neighbors who are computer shy. I hope you keep up the recipe development! Thanks again. ?❤️? Thank’s a million for the valuable tips, I still have a lot to learn in the kitchen.